Yesterday morning when i took the dressing off my arm to change it, i discovered that finally finally finally after two and a half months, i have a real, honest-to-goodness scab where the skin is missing. I would have tap danced for joy except i was standing in the shower and prudence prevailed. This little shred of good news has so turned my head around that i am positively ebullient. What slough of despond? 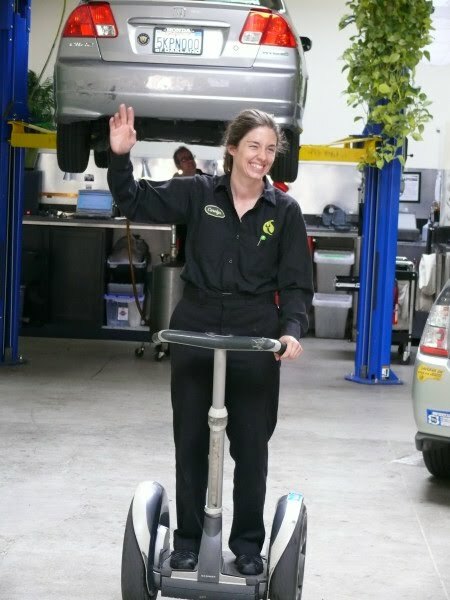 I was so excited that today, in the course of a routine maintenance at Luscious Garage, my fabulous new auto shop that i cannot too highly recommend, i accessorized my Prius. Well, it was that or spinning hubcaps. And unlike my previous mechanics, she writes entertainingly. Here’s her blog, and note the date of this entry.